The Asian region, and particularly China, is becoming a hotbed of investment activity. There have been quite a few accounting scandals in Asia in the recent years – now rivaling those we have seen in the Americas and Europe. Assessing potential or active overseas investments requires reliance on financial statements, the full parameters of which may vary from region to region. To effectively analyze statements, it is necessary to first understand the framework underlying these financial statements and then lay out a protocol for detecting irregularities. It's impossible to create and implement a practical plan without a deeper knowledge of the various factors at play. The book uses real-world examples to illustrate the concepts presented, with the focus on Asian companies. 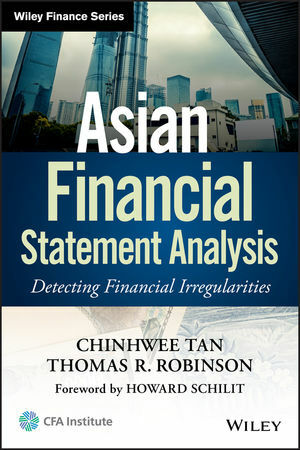 As the first ever in-depth study on manipulation and irregularities in the Asian market, Asian Financial Statement Analysis: Detecting Financial Irregularities is uniquely positioned to be a valuable resource in the move toward the next phase of global reporting standards. CHINHWEE TAN, CFA, CPA, is the founding partner in Asia for a leading global alternative investor, among the largest in the world. He is a pioneer in special situation investing in Asia and has a track record of investing in more than 100 deals. He was voted by The Hedge Fund Journal as one of the emerging top 40 absolute return investors globally and was also named as Best Asia Credit Hedge Fund manager by The Asset. He is the winner of the 2013 Distinguished Financial Industry Certified Professional (FICP) Award from the Singapore government. THOMAS R. ROBINSON, CFA, CPA, is Managing Director of the Americas at CFA Institute. Previously, Tom served as Managing Director of Education at CFA Institute, providing vision and leadership for a 100-member global team producing and delivering educational content for candidates, members, and other investment professionals. Prior to joining the CFA Institute, Tom had a 25-year career in financial services and education. Tom has published regularly in academic and professional journals and has authored or coauthored many books on financial analysis valuation and wealth management. Tom is a CFA charterholder, a Certified Public Accountant (CPA) (Ohio), a Certified Financial Planner (CFP®), and a Chartered Alternative Investment Analyst (CAIA). He holds a bachelor's degree in economics from the University of Pennsylvania, and a master's and doctorate from Case Western Reserve University.